An exotic blend of coconut and mangrove trees, soft coral beaches, and gorgeous reefs teeming with exotic fish and marine life located close to the Equator. Discover paradise swimming and snorkelling surrounded by beautiful reef and an abundance of marine life. 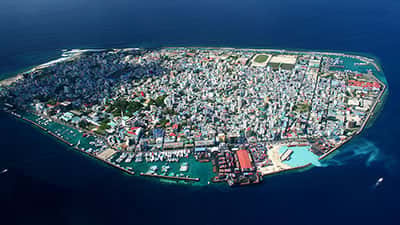 The lowest country on earth, The Maldives are the exposed top of a submerged mountain ridge with only an average of 1.5 meters above sea level. Go snorkelling with manta rays in Banana Island, drop anchor in Gulhi Island and visit small peaceful fishing villages surrounded by breadfruit and mangrove trees. Spend your adventurous days and relaxing evenings in any of the breathtaking islands in the Maldives strung across the Equator. The Maldives are sunny and warm year-round, being so close to the Equator. Watch out for monsoon rains and heavy winds from May to October and November to April.